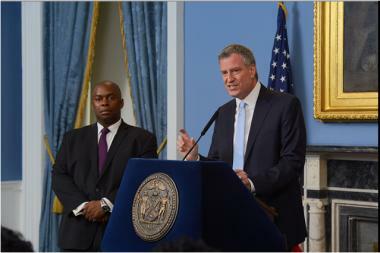 Mayor Bill de Blasio announces the appointment of Richard Buery (L) as Deputy Mayor of Strategic Policy Initiatives. MANHATTAN — Mayor Bill de Blasio tapped the former Children's Aid Society chief to spearhead the city's universal pre-kindergarten program, in the latest step in his effort to bring early education to all New York children. Richard Buery, the 10th president and CEO of the Children's Aid Society, where he ramped up pre-K and other programs in low-income communities, was tapped by de Blasio to be deputy mayor of strategic policy initiatives. The new position was created to oversee interagency efforts to get the city's UPK program off the ground, de Blasio said. "To those who think this mayor is moving too quickly, you don't know this city," said Buery, whose organization doubled the number of children it served in its 12 programs across the city to 2,500 in 2013. De Blasio has pledged to create 54,000 full-day pre-K seats by this coming September, and up to 70,000 seats by the following school year. He has been playing political chess with Albany to get the ambitious program funded — and said Buery will begin making pilgrimages upstate immediately. "Rich is going to be spending some quality time in Albany," de Blasio told reporters during his announcement at City Hall Tuesday. "Lucky man." The mayor wants to raise $340 million a year through a tax increase on New Yorkers earning more than $500,000 so the city can have a dedicated funding stream for UPK. Gov. Andrew Cuomo, on the other hand, wants to add $100 million in state funding next year to the roughly $385 million in funding used for pre-K statewide. "It’s clear that we have a path ahead, a very clear path, to get this done," de Blasio said, reiterating the need for a dedicated tax stream. "We’ve said very clearly, we need the amount of funding, we need a consistency of funding, and the only way that can be achieved is through a tax on the wealthy." The city is hoping to rely heavily on community-based organizations to help boost its roster of free pre-K in order to expand the number of seats, a sector that should be familiar to Buery, experts said. As deputy mayor for strategic policy initiatives, Buery will also assemble a new "Children's Cabinet" and help launch 100 new community schools in low-income neighborhoods. He will also oversee afterschool programs. Buery with also have a close working relationship with Schools Chancellor Carmen Fariña, de Blasio noted, adding that the new deputy mayor will also help meet the fast-tracked deadlines for the UPK program by coordinating with the city's Department of Education, Administration for Children's Services, which runs Head Start programs, and Department of Youth and Community Development. "Carmen is very enthusiastic on our pre-K and afterschool plan, but obviously she has the largest school system to run," de Blasio said, adding that with Buery, it "helps to have a focused leader." Buery, who was born and raised in East New York, is the son of a New York City public school teacher and a lab manager.